Outdoor Recreational activities in Midcoast Maine. Open Late May- early October Weekends (weather and volunteer availability permitting). Visit the restored keepers quarters, climb the tower and purchase items from the gift shop. http://www.stgeorgemaine.com/town_parks_rec.html -Go to this link -Scroll down to a tan box titled �Fun for All Ages� -Under walking trails are two great trails. -Click either one and get a PDF to explain the details including where it is, what you�ll see and some history about the area. One of the best loved views on the Maine coast is from the summit of Mount Battie. 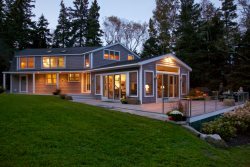 The allure of the mountain derives not from its size (shy of 800 feet high), but from its prime location above the town of Camden and its bare summit ledges affording outstanding panoramic views of Penobscot Bay. Maiden`s Cliff is part of Camden Hills State Park, with views of Megunticook Lake and its surrounding woods and countryside. It is a very popular destination for tourists and is easily recognizable by the white cross standing on the top of the 800-foot cliff. The trail towards the top is a mile long, with the first half a steep climb while the last part is more on level ground. The hike to the cliff will normally take around forty-five minutes to an hour to complete. There are two outdoor tennis courts in the area. One is located in South Thomaston on Route 73 near the Fire Department. The other is in Tenants Harbor on Route 131 near the baseball fields. Both are open for public use. SummerMaine loves these guys! Rent a kayak or SUP board and have it delivered to your door (or shore). Take a tour with Port Clyde Kayak along the coast of Port Clyde. Instruction is provided for all skill levels. Kayaks and SUPs are top of the line, both to rent or buy. Please call to reserve. Join Capt. George Harris aboard the Super Fly for your chance to catch Stripers, Bluefish, schoolie Tuna, Herring and Atlantic Mackerel. Your sure to have an educational and enjoyable day on the water. PS Capt. George is a great friend of Fletch�s � he knows all the birds in the area as well and is a really nice guy! Capt. Neal Parker offers private day sails to families and small groups aboard the Muscongus Bay sloop Rambler. All trips are customized to your vacation so the sloop sails at the time of your choice - morning or afternoon. The Rambler is perfect for weddings and anniversaries. Morning in Maine offers day sails, private charters, and special events from the Rockland city pier. Email: [email protected] Contact: Capt. Bob Pratt, Marine Biologist Capt Bob will also take you and your group fishing in Penobscot Bay. Lighthouse and lobster tours from Camden Harbor aboard the Lively Lady. Also offering private charter tours. Offering flexibly scheduled, affordable, custom adventures for all ages and interests. Sail Penobscot Bay to see lighthouses, sea life, schooners. workboats, islands and the Camden Hills with a knowledgeable Captain. Available Half or Whole day, or Hourly for up to six people.